If you are visiting Miami and are looking for an exciting December fishing trip, we suggest you jump on one of the top-rated deep sea sport fishing charters in Florida. Click here to email us about our Florida sport fishing charters and December fishing trips. 7-day guided Wyoming mountain lion hunt in the beautiful nountains of north central Wyoming. Click here to email us for more information on our mountain lion hunting in December. 4-day guided west Texas whitetail deer hunt with lodging, meals, and trophy care for $2,900 per hunter and discounts for youth hunter. Click here for information on our Texas whitetail deer hunt in December. Third generation outfitter offers both traditional lodge-based hunts during the rut as well as exciting camp-based alpine expedition hunts. Call or click here to email us about our mule deer hunts. 3 to 7-day all-inclusive Costa Rica fishing in December with meals, lodging and boats. Click here for details on December fishing in Costa Rica. 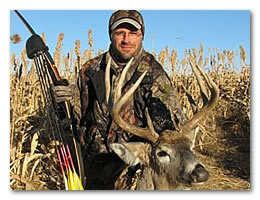 6-day semi-guided Kansas archery whitetail deer hunt in December with meals, lodging and trophy care. Click here for details on our archery whitetail deer hunt.